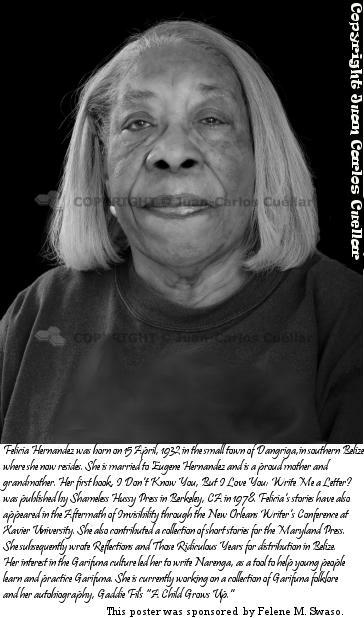 Her name is Felicia Hernandez and she is a Belizean from the town of Dangriga, where she was born approximately seventy-six years ago. She attended Sacred Heart School and started her teaching career there. Dangriga was also the place where she met her husband and began raising her family of seven children and one adopted son. She and her husband taught in several villages and towns in Belize before migrating to the United States, where their last daughter was born. While she was always interested in creative writing, her interest peeked in the US. Even though she was working, she did not give up her interest in reminiscing and eventually putting on paper accounts of her Dangriga childhood to adulthood experiences; parts of which she mentioned in her writings. She is presently working on a fuller account in her current novel “Gaddie Fil: A Child Grows Up”. She was always fascinated with literature and writing. As a child, she loved to listen to stories her mother read to or told them. She was just as excited when her older brother and sister read stories from their school books. After these reading and story-telling sessions, she was anxious to get hold of these books. She would play-read or look at the pictures, so she could get the gist of the stories that were illustrated in the pictures. These early exposures gave her some advantage over her peers. She also increased her communication skills which drew her much praise from her teachers. This created enjoyment of drama and a love for the expressive reading of stories and poetry. It brings out the beauty and richness of the writing which greatly inspires her. As Sybil Seaforth expressed it in “Writing About Fiction”, in Caribbean Women Writers, in 1990, and she quote, “Sentences strung together so eloquently that they fall like muse on a reader’s ear”. It reminded her of her Standard One teacher, whom she will refer to as V.L.D., when he read Longsworth’s “The Children Hour”, it sounded like music to her ears. As she grew older, she wanted to address many issues that she was concerned about. Unfortunately due to societal pressures, she found herself shying away from being as articulate as she knew she was capable of. Growing up in Dangriga, the unspoken sentiment of the day was that Belizean women should be seen and not heard. She resorted to keeping a journal. In this way she could express her thoughts and feelings without reservation. When she and her family migrated to the United States, she was able to gain wide exposure to all types of literary works, especially the works of black women writers such as Alice Walker, Maya Angelou, Toni Morrison and Zora Neale Hurston. She also became aware of Caribbean writers such as V. S. Naipaul and Gabriel Garcia Marquez. Naipaul and Marquez wrote about situations similar to those in Belize. She was greatly inspired by these new exposures. During this period, she also subscribed to and read magazines like Essence, Redbook, and Ladies Home Journal. The stories and essays in these publications were so similar to her stories and essays that it evoked in her the impetus to write about situations and experiences that were bothering her. Then one day she shared her work with an acquaintance, then a student at Xavier University in New Orleans. He encouraged her to submit a piece to the “Aftermath of Invisibility”, a publication by students of the University. Her piece was entitled, “That’s The Way It Was”. It was about adjusting to life in the United States as a pregnant mother with six children, and a husband who was only earning six hundred dollars a month. She wrote several pieces after that, mostly autobiographical. She was always shy about her writing until she read Maya Angelou’s, “I Know Why The Caged Bird Sings”. Among other things, she thinks her interest in writing and publishing was spurred when she bought a program entitled “Writing for Children" from the Writer’s Digest. She regretted that purchase, because it was not worth the price she paid. This was in 1972; but it spurred her to enroll in a creative writing class at the University of Santa Clara. The professor was excellent and taught her a lot of the basics of creative writing. Towards the end of that same year she took a job with the San Jose Sun as a columnist reporting on the San Jose School District and community activities. Her salary was twenty five dollars per weekly submission. During that same period she started working on her first novel entitled, “She Don’t Know You, But she Love You”, published by Shameless Hussy Press of Berkeley, California. This is a collection of the thoughts, emotional responses and expressions of young people in Santa Clara Juvenile Hall where she worked part-time. For this publication, she received an award from the Founders’ Day Association of Alum Rock School District in San Jose. For two years she searched for a publisher with very little success. So her next publication entitled, “Those Ridiculous Years”, was self-published. It is a collection of short stories depicting school-age days and her working experiences and associations in Belize. She has great interest in writing essays. She has a few unfinished pieces, which she had put aside in order to complete a children’s language book written in Garifuna and English, entitled “Nerenga”. She received a grant from UNESCO to complete this work. Nerenga was published in 1993 by Chanti Publication. The book was intended for use in early childhood education and in the home. The accompanying CD facilitates clarity and accuracy of pronunciation. She retired from teaching in 1991 and moved with her husband to New York in the early 90’s which allowed her to continue her writing education career. She enrolled in, and later graduated from Suny Empire State University. New York offered so many opportunities in the Arts. While there, she was able to attend Caribbean Women Writers’ International Conferences at Wellesley College in Boston and in Florida, where she was inspired by diverse groups of women writers from the French, Dutch and English-speaking Caribbean. She participated and presented a paper in Garifuna at a Conference of Caribbean Women Writers in Miami, Florida in the summer of 1995. Since returning back to Belize around 1999, she has participated in a conference in Santo Domingo and completed one publication entitled “Reflections”, which is a collection of essays. I have never heard of her before, but her book sound like something I would like to read. Thanks so much for visiting and commenting on my blog post. Mrs. Hernandez is an extraordinary and remarkable woman. First for raising six children,and second for all that she has accomplished. As a Belizean I admire her and think she is an inspiration that our young people should aspire and look up to. Her book can be purchased at bookstores in Belize City. You can also click on the links below the article to find out more. I just checked out your "Spotlight" person! Very nice write up. I like her for 3 reasons, make that four, she's Garifuna, Belizean, a writer and my cousin! Good choice of a spotlight person. Mrs. Hernandez has accomplished a great deal even while raising 6-7 kids! I feel like a wimp next to her! Nice article on Mrs. Hernandez it is good to see/read about this remarkable woman. VIEW FROM CROOKED TREE VILLAGE: CLEAN-UP DAY! !